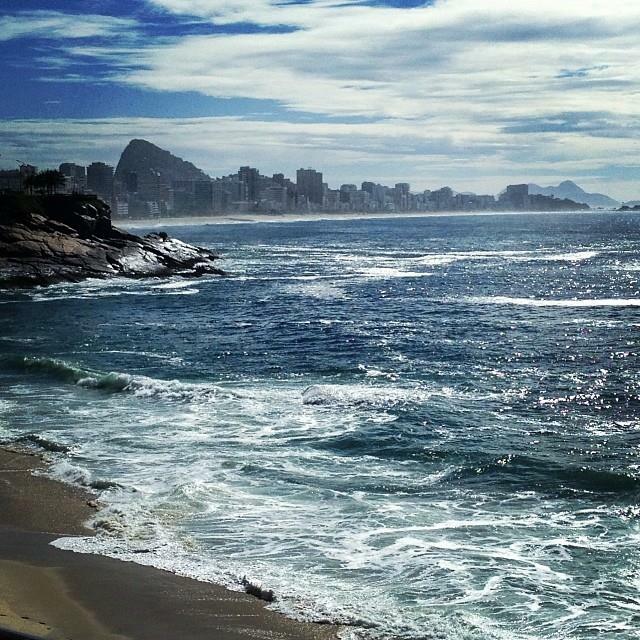 I recently returned from a wonderful weekend stay at the Sheraton in Rio de Janeiro. 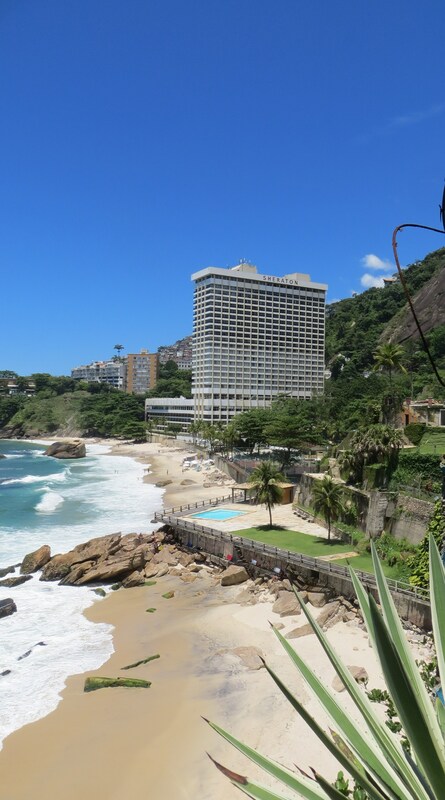 Nestled in a little cove off Leblon beach, the hotel offers an oasis compared to the hustle and bustle of Ipanema and Copacabana beach, not to mention that the view is breath taking. The hotel structure is rather old fashioned from the outside as it is a large block tower that clings to the side of the hill. However, on the inside the hotel is modern, and certain areas of the hotel are under refurbishment – probably in time for the world cup. 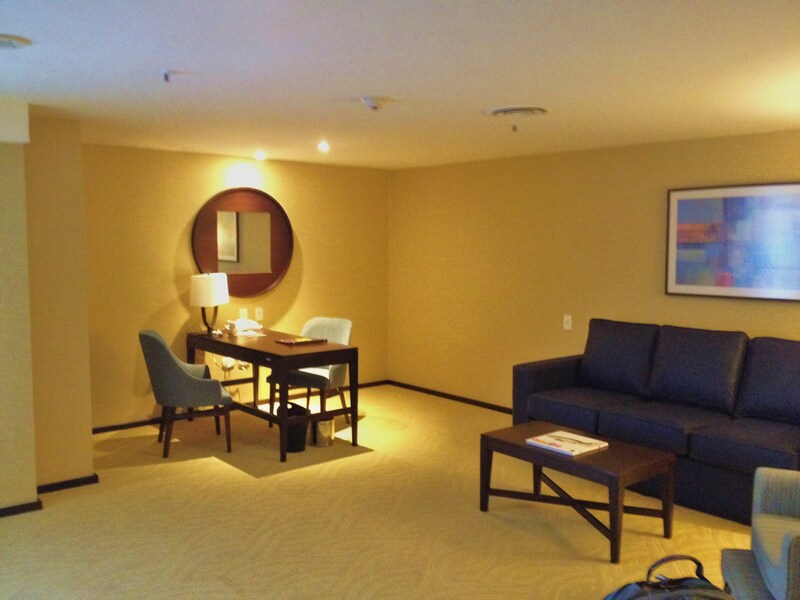 As C is constantly travelling, and often stays at Starwood chains we were upgraded immediately upon check-in. Our suite was fantastic. 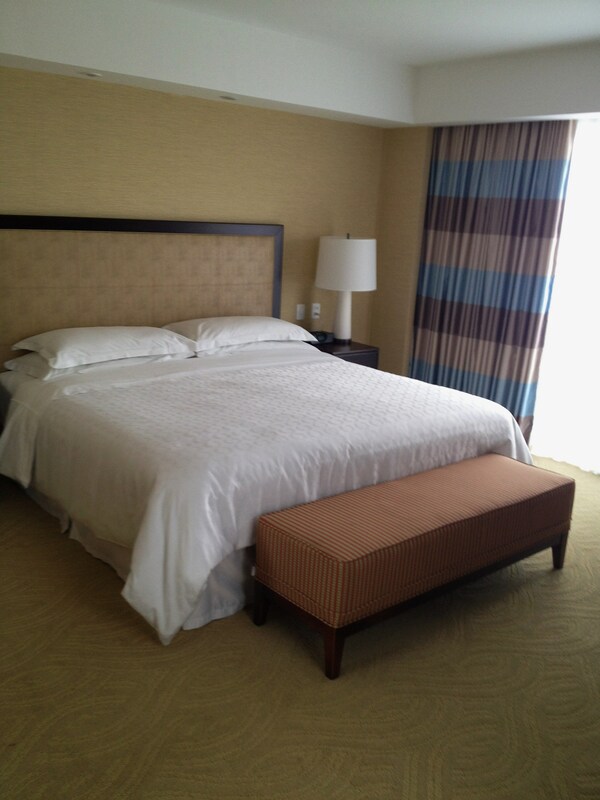 I don’t think I have ever stayed in a better appointed hotel room until I got to the Sheraton. We stayed in room 326 and you could tell that a huge amount of thought and care went into the design of this suite and the attention to detail was superb. Did I mention the view?! 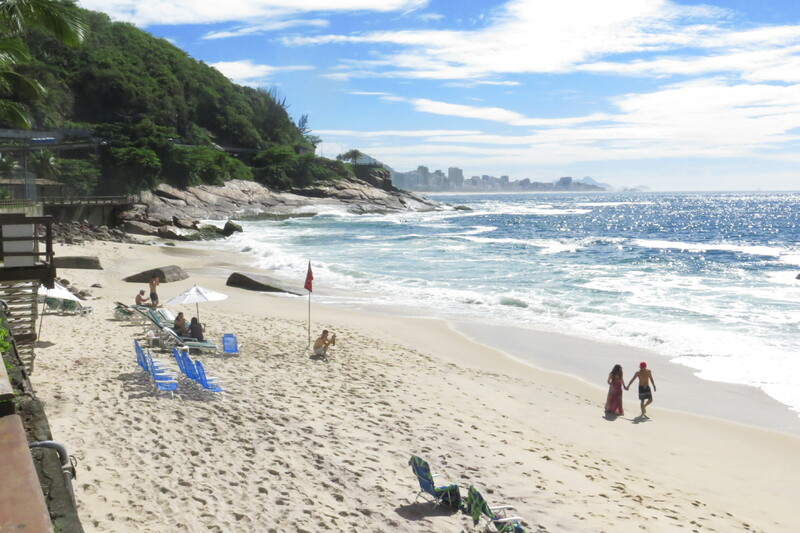 When I opened those curtains my jaw dropped – an unobstructed vista of the pristine Atlantic ocean presented itself, and to the side you could see the long stretch of sandy beach of Leblon and Ipanema. It was stunning. The view that greeted me first thing in the morning! I have to go back and talk about the room and it’s features as I thought it was really impressive. It did not feel like your typical hotel room. It was so tastefully set up, with tweed textured wallpaper in the living and bedroom, modern Brazilian art on the walls, furniture that I would want in my own home (apart from the faux leather couch! ), and quite a daring curtain that had thick blue, brown and beige horizontal stripes, which initially I was not fond of, but after awhile grew to appreciate (I could see that the colour combination was chosen to enhance the colours of the sand, rock and ocean around you). Another element that both C and I noticed was that not only was there numerous electrical outlets, but many of them were at easy to reach locations, such as above your bedside table. How many times have you been at hotel where you a forced to rearrange heavy furniture, pull out the bedside lamp chord just so you can charge your phone?! I’m sure that is something that is familiar to you all! It is precisely for this reason that I say the design of the room is so well thought out. What I loved most about the Sheraton in Rio was their grounds. As mentioned previously, the hotel is nestled in a cove and at a base of a hill/mountain (depends what you classify as a mountain! ), which not only gave you spectacular views of the ocean in front of you, but also spectacular views of the hill behind you that towered over the hotel. 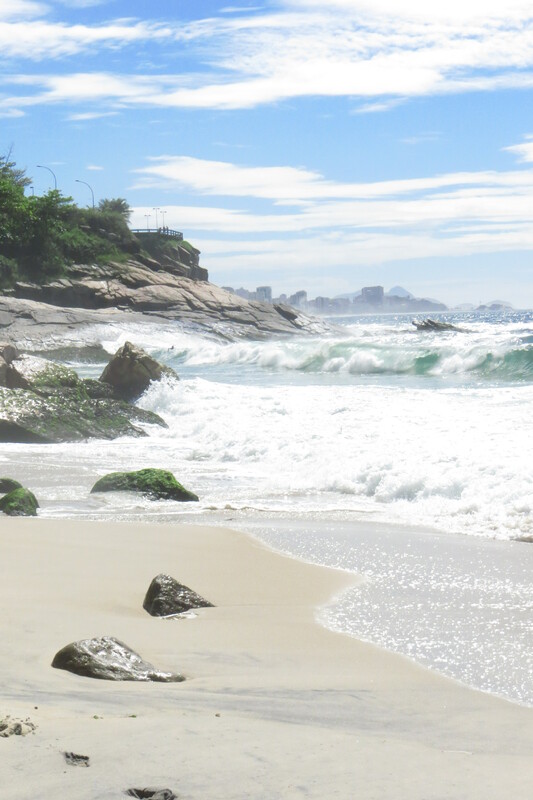 Also, due to the location, there are only two ways to enter the beach, either through the hotel, or through a very steep and narrow path at the side – which means it is a lovely secluded spot, with just a few hotel guests and some brave Brazilian boys and girls body boarding near the rocky cliffs! The hotel also has two large swimming pools, one right in front of the hotel with an adjacent baby pool that is for families and guests just wanting to lounge around the pool and get their tan on(that would be me! ), and another slightly further a field that looks like it is reserved for exercise. There was a hot tub as well, but unfortunately I never got a chance to use it, as it seemed to be always occupied by a very good looking couple that couldn’t seem to take their hands off of each other – hence it would have just been a bit awkward if I tried to squeeze in between them! As far as I am aware there are three restaurants currently open at the Sheraton, one in the actual building on the 5th floor where you go for breakfast, and then two by the swimming pool area. However, as we were doing a lot of sightseeing we only ever ate at the Pizza restaurant, which I have to say, is the SWEETEST little restaurant that I have ever seen! The restaurant is in a tiny tiled house that is nestled between a big boulder and a tree, with a large wooden deck and serving simple food. I don’t know what the history of the house is or if there even if there is one, but it is so different in style compared to the hotel that it gives such a charming ambiance around the pool area. 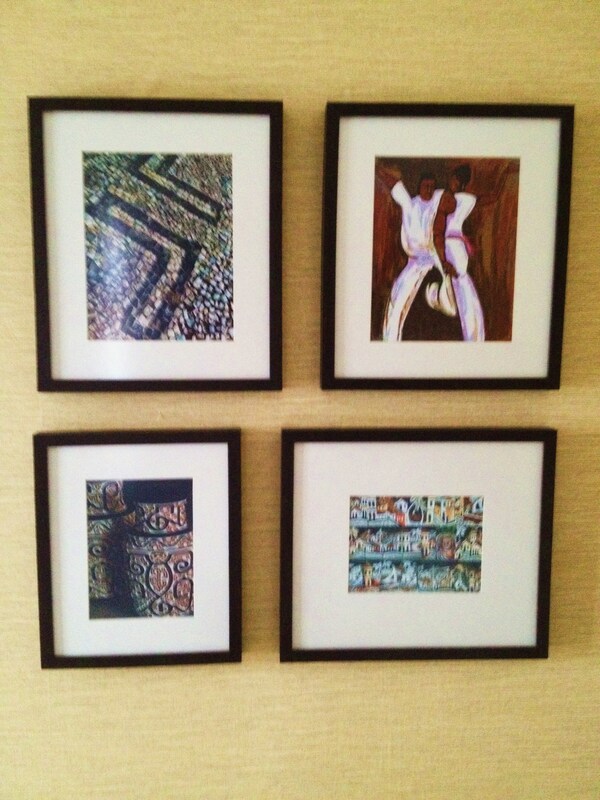 Although I loved our stay at the Sheraton, there are a couple of drawbacks which I wanted to bring to your attention. The first is it’s location. What makes for a very idyllic and quite oasis in the bustling city of Rio de Janeiro when you are on holiday, also makes for a very difficult commute during rush hour. As there is only a small windy road in front of the hotel, the traffic comes to a near halt in the mornings and evenings. Hence, if you are staying here for business and need to get to meetings, this may not be a good hotel for you. One evening after a full day of sightseeing, we were in a taxi on our way back around 18.30 when suddenly everything came to a stand still, and the taxi driver told us that we were better off walking (which we did). The other aspect which I have to say annoyed me but which I still see a lot here in Brazil, is their internet policy. In this day and age how can you still charge for internet – especially when it is such a large hotel like the Sheraton? For us, we were given free internet access during our stay, as C is a ‘member’ of the Starwood Preferred Guest program due to his frequent travel. However internet access should not be a ‘gift’, this should be a given that your room has free wi-fi. If I was here on business, I really would not have been impressed that my only option for free wi-fi is to use the common computers found in the lobby. This is something that I feel has to change. However, as I was not there on business and I had no deadline to meet or meeting to attend, these are two minor grievances for me. 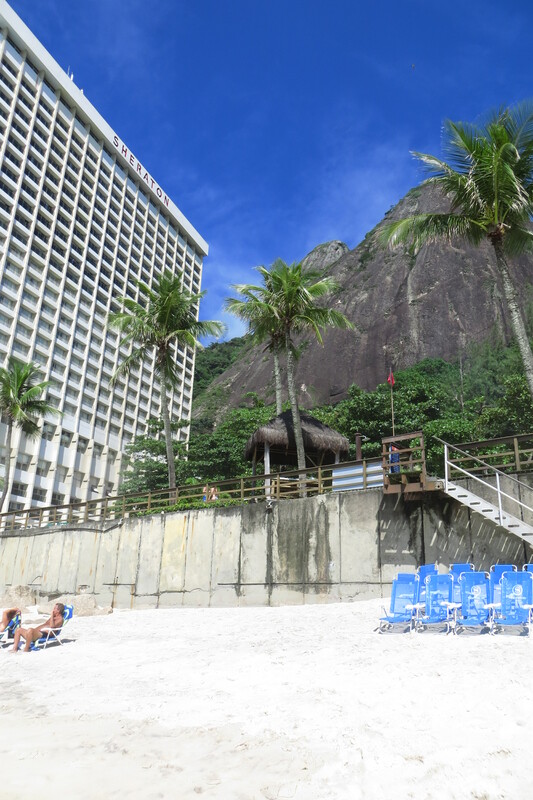 I loved my time at the Sheraton in Rio, it truly was such a wonderful few days, that it would be hard to stay anywhere else again the next time we are in town! Sorry…I had to add one last photo of the beach and ocean, it just makes me so happy! Posted in Hotel, Rio de Janeiro, Travel	LeblonQuite hotels in RioRio de JaneiroSheraton HotelWhere to stay in Rio? Next > Wishing You All A Merry Christmas! Hi PJ. Thanks for your wonderful comment, it makes me so happy to read that you are enjoying the blog and it really encourages me to continue putting in so much effort :) What a great situation you are in that the kids have flown the nest and you have a little bit of extra cash to enjoy your travels! I hope that this blog inspires you, and if you ever need any suggestions, please don’t hesitate to get in touch! You know I had no idea you could stay in the favelas until my trip to Rio and went on a favela tour. It is great to hear how the government is finally taking active measures to clean up the favelas from drug crime. I have a feeling Rio’s favelas will be the next big thing! Those beaches look stunning, and especially tempting right now when its wintry ice on the ground out here:) Rio is definitely on our travel list…gonna get back to these posts when we plan it!